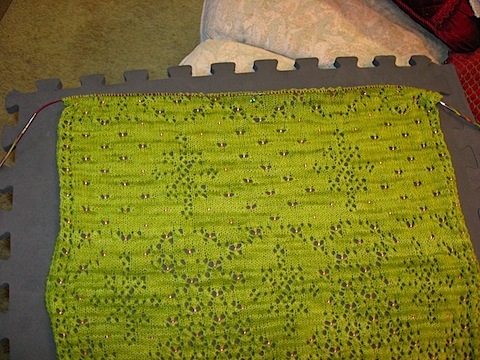 The yarn is Malabrigo laceweight in a light green (“lettuce”). Malabrigo yarn is always variegated, because it’s kettle dyed– that means the dyes are absorbed unevenly by the yarn. Variegated yarn inevitably adds a kind of “striping” to your finished object, but since the stole will be worn horizontally, the stripes will be more or less vertical. 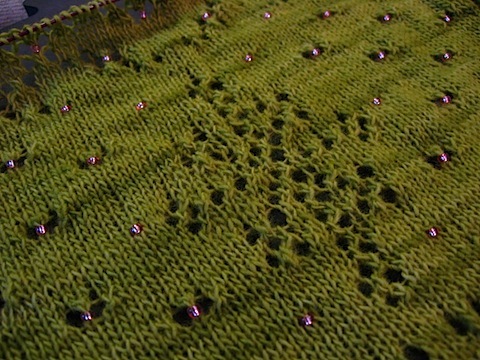 Also, they’re not terribly pronounced, against the pink beads and the overall lace pattern. Amazing – love the beads and lace!